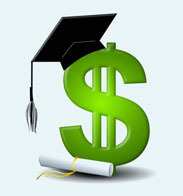 DEADLINE FOR SCHOLARSHIP APPLICATIONS IS FEBRUARY 15 - APPLY TODAY! 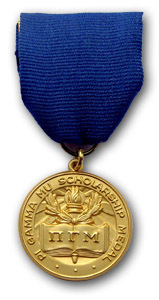 Each year, Pi Gamma Mu awards 11 scholarships to outstanding members. Three scholarships are worth $2000 each, and the other eight are worth $1000 each. These scholarships are intended for the first or second year of graduate work in the social sciences. If you are interested in applying, you should start putting your information together right away. In general, service on the Board of Trustees offers many rewards. Perhaps the most important reward involves recognition of student excellence and seeing the joy students show upon their recognition. Sometimes Trustee responsibility involves making hard decisions--raising membership fees exemplifies a hard decision. Each year the Trustees create a budget that maintains our service to students and chapters but keeps cost within the revenue; revenue comes primarily from membership fees. As the task of keeping costs within revenues has become increasingly difficult, the Trustees turned attention to the membership fee. News in this issue comes from the Georgia Xi chapter at Brewton-Parker College, the Texas Eta chapter at Texas State University, the Colorado Theta chapter at Adams State University, and the North Carolina Omega chapter at Livingstone College. Pi Gamma Mu is a unique honor society in a number of ways, two of which I find particularly valuable to its members. First and foremost, Pi Gamma Mu recognizes excellence in all of the social sciences and, therefore, creates an environment in which individuals from a variety of disciplines can come together to share their interests, research, and lives. As you know, 2014-2015 is an important year for Pi Gamma Mu. The society celebrated its 90th anniversary in 2014 and this year we are focusing on growth. 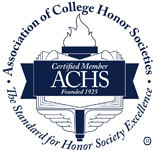 In order to maintain fiscal stability and prepare for a strong future we must continue to grow by inviting more outstanding students who deserve to be honored by an invitation to become lifetime members and we ask for your help. VOLUME 90, ISSUE 1 (2015) OF THE INTERNATIONAL SOCIAL SCIENCE REVIEW IS NOW LIVE! - Now there are two ways to become a Star Chapter! We are excited to announce that new Pi Gamma Mu merchandise is now available on our merchandise webpage. Our exclusive merchandise not only gives you the opportunity to proudly display your achievement and affiliation with the society, but merchandise purchases also support the activities of Pi Gamma Mu and help us finance our programs and awards. The FBI is conducting a career campaign to fill open cyber security positions and they are interested in receiving applications from honor society members. If you are looking for a challenge that puts your talents on the global stage, or one that unites your passion and your purpose with the power to literally transform your community, you should consider applying for a position with the FBI's cyber security team. The scholarship award is a time-honored tradition of Pi Gamma Mu. 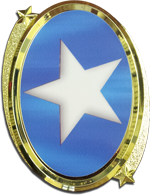 This award has been in use since the early days of the organization. Once a year chapters have the privilege of awarding one medal to a person who has distinguished him/herself in the social sciences. It has usually been given to an outstanding student as a prize for scholarship and/or service. However, it may also go to some other person deserving recognition in this field or to a faculty officer of a Pi Gamma Mu chapter. Kaplan Test Prep is looking to bring teachers onto their team immediately for classes starting throughout Bronx, Brooklyn, Manhattan, Queens, New Rochelle, and Westchester, NY. These area schools only recently confirmed the program with Kaplan and are hoping that Kaplan can find teachers to begin supporting their students right away.